Mothers Day is an important time of the year where there are excellent opportunities to bring in extra revenue. 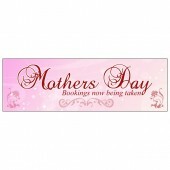 Discount Banners provide a range of Mothers Day Banners for you to choose from. 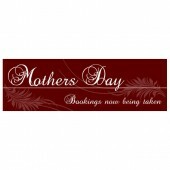 Whether you are a restaurant, shop or salon we have a Mothers Day Banner to meet your requirements. 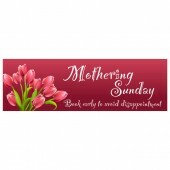 Perfect for advertising promotions, window displays and Mothers Day table bookings, our Mothers Day Banners are available in 8’x2’ or 10’x3’. All of our Mothers Day Banners are printed on high quality PVC using eco-friendly inks, so you get a stunning, full colour product, with the environment in mind. Your Mothers Day Banner will be received 2-5 days after your order has been placed.